No industry has escaped the economic changes of the last decade, and the marine industry is certainly no exception. But with every economic struggle emerges new solution providers, poised to help fill new needs. St. James Stevedoring Partners LLC is among these innovators in the marine industry. It operates the state-of-the-art St. James Stevedoring (SJS) bulk handling operations along the lower Mississippi River serving ocean going vessels and river barges and transloading millions of tons of dry bulk commodities. To offer the most efficient transfer of bulk cargo between ocean vessel and river barge, SJS uses 10 mobile harbor crane barges. This mid-stream transloading of cargo provides maximum efficiency, flexibility, and value to its customers. Striving to continuously evolve, SJS is fully committed to finding and evaluating high-quality and reliable technological solutions that will improve its operations and service. Lighting efficiency has emerged as a key factor. 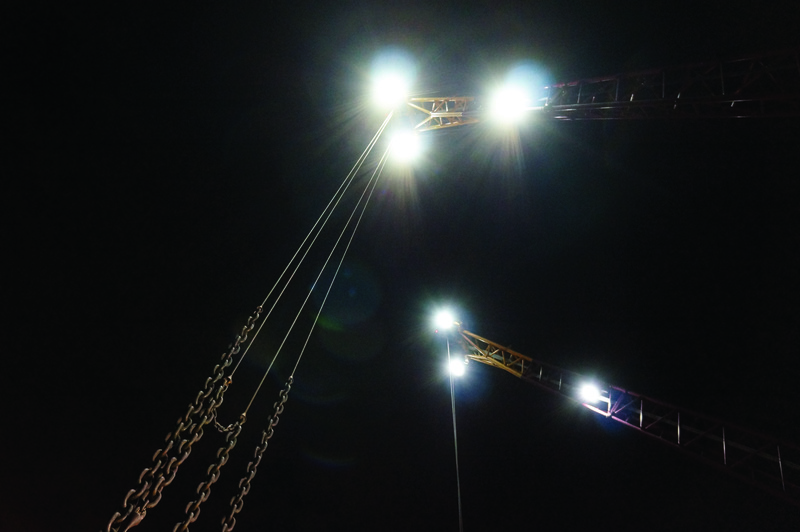 With the goals of innovation, efficiency and safety in mind, SJS began working with Phoenix Products Company to outfit its Gottwald Model 8 mobile harbor cranes with LED floodlights. 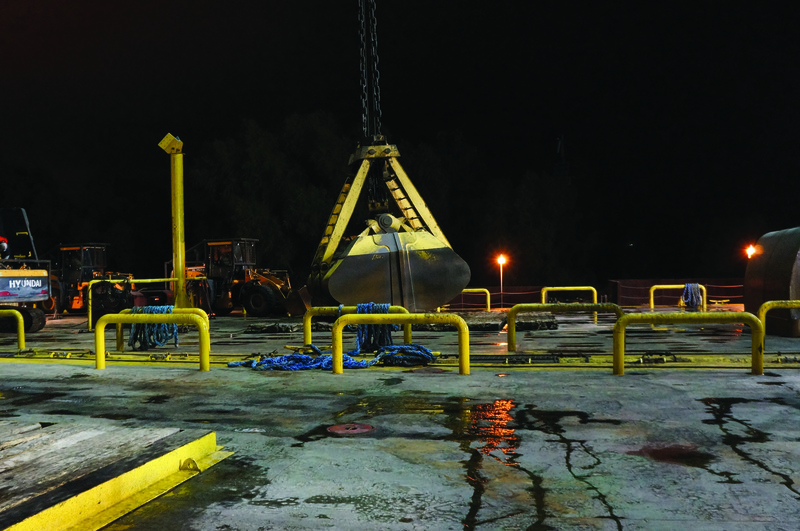 The companies collaborated to understand the challenges of lighting a barge-based bulk handling crane and ultimately chose ModCom Hi 300W LED floodlights with a customized optical arrangement to replace the existing 1000W Metal Halide Fixtures. To fully analyze this new option, SJS wanted to directly compare the lighting on two of the crane barges – one retrofitted with LED fixtures and one with existing traditional metal halide lighting. The KevinD barge was used as the reference for their existing lighting technology, and the C.J.L. barge was chosen for the retrofit. It is now among the first mobile harbor cranes to have the main production and boom lighting converted fully to LED. 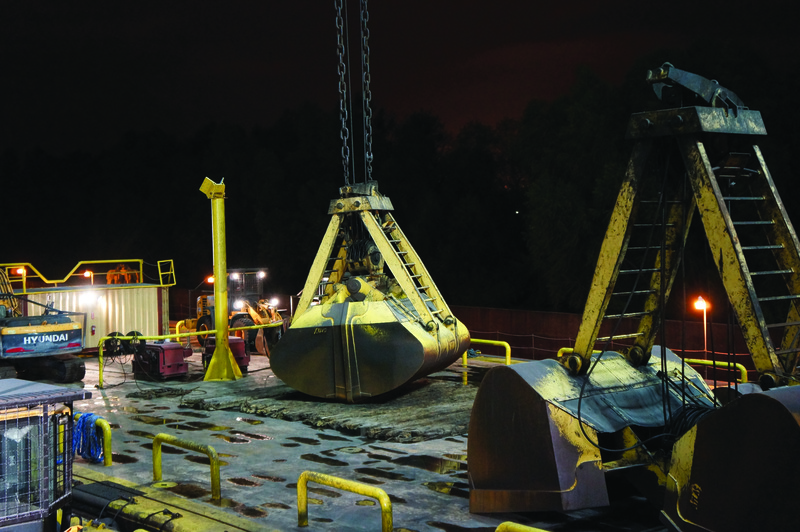 Many lighting challenges result from the high-vibration environment of port equipment. The constant, rapid movement of cranes does not enhance the reliability of traditional lighting fixtures, making maintenance a huge expense. And, for a bulk terminal that faces the demands that SJS experiences daily, consistency and productivity are imperative. The cranes are operating 22 – 24 hours per day, seven days a week. There is no time for unscheduled maintenance, especially since replacing a broken lamp involves laying the crane out on the deck of the barge and keeping the crane out of service for up to two hours. Whether it’s to replace a broken lamp or repair a fixture, sending someone to perform maintenance on port equipment is time consuming, expensive and dangerous. Because LED lighting is solid-state technology, there are no moving parts, fragile laments, or breakable glass. Quality LEDs are also typically rated for 50,000 hours. For a fixture that is on 12 hours each day, that equates to more than 11 years. Traditional lighting like the 1000W metal halide floodlights installed on the KevinD requires up to a 15 minute warm-up period following a power interruption. Conversely, LED fixtures reach full brightness in less than a second. For a facility like SJS, the elimination of warm-up time increases productivity by an average of 5 – 7 cycles for every shutdown during night operations. Safety on the deck of the barge was SJS’ number one consideration when teaming up with Phoenix to outfit the cranes with LED fixtures. The technology has greatly increased the safety at night on the C.J.L. by eliminating periods of darkness while traditional lighting fixtures need to warm up following an operational shutdown. In the event of an emergency situation, LED lights can be turned on quickly so that assistance can be safely and immediately rendered. Because of the “instant-on” feature of LED technology, SJS crews are more comfortable with turning off the main crane generator and switching to auxiliary generators, which increases the opportunity for fuel savings. All of the light output of an LED fixture is directed at a targeted area. An LED fixture incorporates an array of point sources that direct light precisely where it’s needed with very little scattering or loss. Light distribution is controlled by the placement of LEDs, as well as by well-designed optics that take advantage of the focal point presented by each individual LED. Light levels were measured on various points of the C.J.L. barge in comparison to the KevinD. While cranes were in working position above the hold, light levels indicated up to 46% more lux measured at selected points on the barge and vessel. It was reported by operators that the C.J.L. barge also experiences significantly fewer shadows due to the specified LED optical package. Crane operators commented that the operational light on the C.J.L. is brighter than it was with traditional lighting, and it looks more like normal daylight. The directional nature of LED light also allows for better illumination to the surface below and improves operator working conditions. When considering that the 61 yard bucket holds about 45 tons of bulk material, the precision of the operation is vital in staying efficient, safe, and competitive. In addition to the operational benefits, LED is considered a green technology, as LED fixtures convert more than 75% of the electrical current they consume into light compared to the approximate 10% efficiency of some traditional lighting options. Once all boom and tower lights were replaced on the C.J.L. by ModCom Hi fixtures, floodlighting power consumption was reduced by 5.6 kW which equates to more than 70%. Combined with the reduction in waste lamps and ballasts, the conversion provides a variety of environmental benefits. LED lighting typically requires a larger investment upfront when compared to traditional lighting. However, the resources saved on energy, replacement lamps and ballasts, and maintenance are often enough to provide a payback period of as little as one to two years. For installations that operate all day, every day like the SJS group or for facilities that operate in regions with rising electricity costs, the return on investment is even quicker. Bulk terminals have an opportunity to improve their bottom lines with LED technology. The sooner facilities adapt to the improved options available, the sooner they will begin to realize the benefits of safety, environmental stewardship, reduced maintenance and cost savings that SJS is experiencing today.